How Do I Microwave a Red-Skinned Potato? Red-skinned potatoes -- commonly called red potatoes or new potatoes -- are a nutritious addition to a healthy, balanced diet. 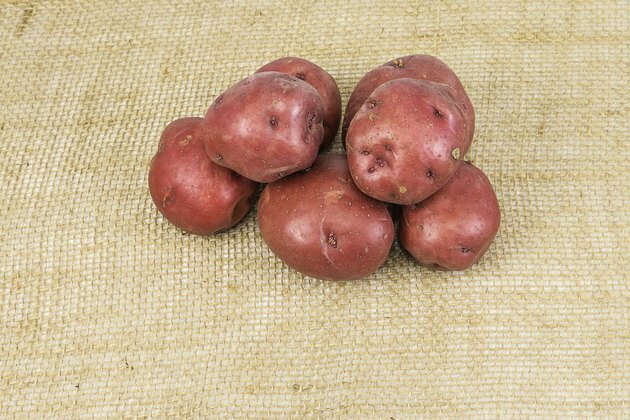 They are rich in nutrients such as fiber, vitamin C and potassium, and they have less starch and a lower glycemic index, or GI, than white potatoes, meaning that eating a red potato won't cause sharp fluctuations in your blood sugar levels. According to researchers at the University of Maine, red potatoes are also dense with antioxidant compounds, particularly if you consume them with their skins intact. Microwaving a red-skinned potato is a quick and healthy way to add the vegetable to your meals. Wash the potato under cool, running water. Use a vegetable brush to lightly scrub off any dirt or debris on the peel. Dry the potato with paper towels. Poke the potato with a fork several times. Put the potato on a plate safe to use in the microwave. Place a paper towel over the potato. Microwave the red potato on high for several minutes. According to the Fruits & Veggies - More Matters website, a small potato may take a total of 1 to 2 minutes, while a large potato may take up to 5 minutes. Turn the potato over halfway through the cooking time, but keep it covered with the paper towel. You will need extra time if you are microwaving more than one potato at a time. Remove the potato from the microwave and allow it to sit for at least 1 minute before eating. To include a red-skinned potato in a meal that has the lowest GI possible, cool the potato after it has been microwaved and serve it topped with a vinegar-based dressing, along with a rich source of protein, such as fish or skinless poultry. Different microwaves may require longer or shorter amounts of time to cook a potato. Start with the shortest recommended time and continue to cook in minute-long bursts until done to avoid overcooking. Fruits &amp; Veggies - More Matters: How Do You Microwave Red Potatoes?